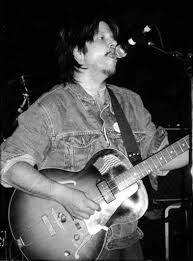 Dropped by Warners, Grant Hart found himself back on SST, the label that had released Husker Du’s three best records. Stripped of Bob Mould’s fizzing guitar and his own skittering drums, Harts first release after the acrimonious split of Husker Du is a hypnotic meditation on regret and loss, full of mystery and magic, and littered with characters struggling to make sense of their chaotic lives, and which may include himself and his former band mates. The opener All Of My Senses offers few clues as to what will follow, coming on like a lo-fi New Order. Warm keyboards and hand claps replace the harsh drones and groans that open the record. According to Michael Azzerad’s book Our Band Could Be Your Life, Hart was using methadone in an effort to conquer his heroin addiction when Husker Du split, although he was sober by the time Intolerance was recorded. Whether or not the song is auto-biographical, its hard to hear Hart singing “I’m using, I’m using” while the gospel backing singers sing “Pulling a plough but I don’t know how” without the feeling that he’s referring to his own struggles with addiction. The guitars are back for Now That You Know Me. It wouldn’t have been out of place on Warehouse Songs And Stories (it was performed by Husker Du live), but a wailing harmonica gives it an almost Dylanish feel (they are both from Minnesota!). Fanfare In D Major builds tension in the verses with rolling drums and sawing strings before exploding with one of Grants greatest pop choruses. Drug references are most explicit on the junkie gospel sea shanty of The Main which creaks and sways like great big clipper ship (I avoided policemen when I went to cop, De Quincey, smack in the middle, the hell that I went through when I stuck it into etc). Grant seems to be saying the experience is universal – “Reeperbahn, Christiana, Pigalle all the same” (these being notorious drug dealing areas in Hamburg, Copenhagen and Paris). Side two opens with Twenty Five Forty One, nostalgia for a shared apartment after a broken relationship. From the sound of it he’d rather be back where “we had to leave the stove on all night so the mice wouldn’t freeze” than where he is now. Given that the title is taken from the address of Husker Du’s rehearsal house where all the members had lived at some point, you wonder if he’s also missing his former band. The inconsequential instrumental Roller Rink leads into the soulful You’re The Victim, the only song I can think of that combines jaunty whistling with what sounds like a dentists drill! Another one that has you wondering if it’s directed at a former band mate ”Every thing you do to hurt me makes you the victim”. On Anything Hart sings of “climbing mountains in my sleep”. She Can See The Angels Coming could almost be a sequel to The Main. Organ drones and cymbals swell, giving the song an oceanic sense of lives pulled this way and that. Reprise returns us full circle for a minute or so of the banging and clanking drones that open All Of My Senses. So lo-fi, in places it sounded like it was recorded in a bin – however, Intolerance exudes warmth and humanity throughout. It does feel like an exorcism of sorts (after all that had gone before), but the general feeling you’re left with is an uplifting one rather than one of self-pity. I’ve passed this album on to a few people (i think i’m on my third or fourth copy at the moment) – and i rarely do that. Both solo and with Nova Mob, the last 25 years have been up and down in terms of quality and consistency with Grant and i think this is definitely his best record (although i love Admiral of the Sea too). Had the honour of having a chat with him after a gig in Portsmouth in 1990, where Intolerance made up most of his set list and he was a true gent – magnanimous about Bob Mould’s Workbook (although he did say “i was kinda expecting ‘more'” and seemed to be enjoying himself again. I wouldn’t call Intolerance a ‘lost’ album, but considering Husker Du’s status, not enough people know about this record … and they need to!!! Thanks Huw, I also saw him on that tour in 1990 in Glasgow and he was on fine form. Totally agree that Intolerance deserves a much wider audience. i saw him on the night England played Holland at the ’90 World Cup and the audience was really consequently really small – probably less than100 people, but him and the band gave it everything. He’s an incredibly soulful person/performer. I had a friend on security who got me and a mate back stage after the gig and we spent a half hour or so drinking with the band, who were also very cool guys. Grant was quiet, circumspect and really nice to everyone.